If you are visiting Moscow for the first time, your trip will be incomplete without getting behind the powerful Kremlin walls. Russia’s main museum – or rather a complex of museums – and the Presidential residence, the Kremlin in Moscow is a must on any itinerary. Its popularity is so high that even those who aren’t much into art or history feel “obliged” to see it. In the latter we talked about the Kremlin Museums and Territory. Let’s see how you can visit these. The practical tips along the different sections on this page will help make your exploration of Russia’s major sight as smooth as possible. And of course, the easiest way to do so is with a Moscow tourist guide licensed to give official Kremlin tours. So, when is it better to start planning your Kremlin visit? As a general rule, as early as possible. The Kremlin attracts thousands of visitors each year, with the biggest number falling on just 5 months: May – September. If you plan to tour the Kremlin during this period, it’s especially recommended to make arrangements ahead. What are the benefits of advance arrangements? A confirmed tour or purchased ticket cannot be cancelled. On some days the Museum's opening hours are unpredictable due to official events. If this is the case, the Territory, Cathedrals and temporary exhibitions, and sometimes the Armoury Museum and Diamond Fund can be closed for visits on short notice or even without it. – ticket purchased at an official Kremlin website. – confirmed guided Kremlin tour. All of the tickets are arranged and bought out in advance. In addition to that, in many cases individual travellers and small groups also skip lines at the entrance. Secure your Kremlin Armoury Museum visit, as there is a daily ticket availability limit to it. Check out the opening hours for each of the museums below. if it’s a public holiday and the Kremlin is open (and the weather is nice), it will likely be busy with locals. if there are official events planned for that day, the Kremlin will be closed for everyone. The Kremlin is usully less crowded on weekdays. Avoid planning a visit for a Thursday! The changes of the opening hours are very possible on 1 May (Labor Day) and a day before/after some most important holidays (like 9 May or 12 June). Russian Christmas is celebrated on 7 January. Thanks to that there are long New Year/Christmas holidays in Russia, starting 1 January and finishig around 8 or 9 January. During the past holidays (January 2015) the Kremlin was open every day, even – an impossible happened – on Thursday! For possible Kremlin closures, check out the Kremlin official website. The information is usually posted within 1-35 days before such an event. Keep your Moscow itinerary open if visiting the Kremlin is a priority and your ticket or a guided tour hasn’t been booked. Better to get this sorted first. 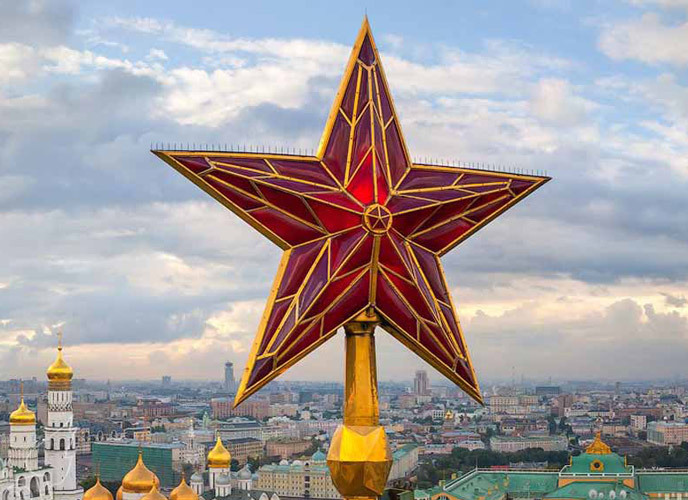 Decide how you’d like to tour the Russian Kremlin: on your own or with a guided tour. Your own visit. Book a ticket via the official Kremlin website. Tickets are usually on sale 14 days (max) prior to the day of a visit. During high-tourist season (May – September), it may not be possible to purchase a ticket online within 3 days of your visit. If it is the case, you will be able to buy a ticket in the Kremlin Ticket Office on a day of a visit. Visit with a guided Kremlin tour. There are several companies in Moscow, which can arrange such tours. The Kremlin and Armoury Museum Tours is our specialization. Our expert guides are licensed to give official Moscow Kremlin tours. Visit Kremlin with us and get the most from exploring Russia’s most important museum. If I follow all of your advises is it certain I will get inside the Kremlin on a desired day? Unless a guided tour booked or ticket is purchased, nothing is certain, unfortunately. There can be an official event inside the Kremlin, for that day tickets / tours may no longer be available. Are there any official group Kremlin tours in English? There are audio-guides in the Armoury Museum and the Russian Diamond Fund, available in key European languages and included to the cost of a ticket. Their number is limited. There are no audio-guides for the Kremlin Grounds and Cathedrals, unfortunately. Free ticket – for visitors under 18 years old. Since January 2015, discounted tickets are no longer offered to ISIC / IYTC cardholders, unfortunately. Patriarch Palace (also referred to as One-Pillar Chamber of the Patriarch's Palace). Temporary exhibitions in the Assumption Belfry (if any) are usually included too. What about Ivan the Great Bell Tower? It is usually open from late spring until early autumn. Access to it is not the easiest. More details here. In 2014, one could buy a ticket at a slightly higher cost that allowed admission to all of the sights above plus Ivan the Great Bell Tower. As regards 2015, the Kremlin has not announced it yet. Where to buy this ticket? online, at an official web site, within 14 days of your visit, there is a certain number of tickets available for purchase online. Between May – September online ticket purchase may not be available within 3 days of a visit. at the Kremlin ticket office on the day of a visit. print out the payment confirmation and take it with you. It will be exchanged to a paper ticket before your visit at a special ticket sales window. bring an official document (usually, a passport). The name of the credit card owner (that is on payment confirmation) and name of the owner of the document must be the same. (In our practice a passport copy worked fine, though it is not in line with the official Museum's policy). online, at the official Kremlin web site, within 14 days of your visit, there is a certain number of tickets available for purchase online. Between May – September online ticket purchase may not be available within 3 days of a visit. at the Kremlin ticket office on the day of your visit. Note: Ticket availability is restricted. We recommend that you book in advance. The Diamond Fund is a separate exhibition inside the Armoury Museum Building. Despite its location, the Diamond Fund Moscow does not belong to the Kremlin Museums officially. So, you should not be surprised not being able to find any information about it on the official Kremlin web site. No advance booking required – buy a ticket as you go. No ticket limits for foreign travellers! There is a limited number of tickets for Russian visitors only, as they can enter the Russian Diamond Fund with a group tour only. Sorry, no group tours for foreign visitors however that does mean you can enter it anytime you wish during the Diamond Fund opening hours. Make sure to have Rubles (cash) to buy a ticket. Tickets to the Russian Diamond Fund are bought inside the Armoury Museum building. That means that they will let you though the Borovitskaya Tower (one of the two Kremlin entrances) without a ticket. The sights, which are not part of a guided tour, can be visited on your own after the tour finishes. We are glad to offer a VIP admission to the Armory Museum, upon request. Please contact us for details. The Diamond Fund tours are expensive, so we usually recommend an unguided visit there. If you’d like a tour of the Diamond Fund Moscow, please contact us. The Kremlin Territory and Museums are open daily, except Thursdays. 10 am – 6 pm. Entry times: 10 am, noon, 2.30 pm and 4.30 pm. 10 am – 6 pm., except between 1 pm and 2 pm. We recommend that you plan a visit there before 5 pm. Every January it is closed for 2 or 3 weeks. Changes of the Museums' opening hours are possible during important official events. The Ticket Office is located in the Alexander Garden, next to the Kremlin main entrance at the Kutafya Tower – the only white tower of the Kremlin connnected to a bridge. The Kremlin Tour Office and Souvenir Store – which is, by the way, very good – are also inside the glass buidling on the picture. We hope you will find this information and practical tips useful to visit Kremlin on your own. Other Questions? Found this post useful? If you found this post useful leave a comment about it below – help us make your Moscow experience and that of other travellers as easy and fun as possible! If you have any other questions or need more clarification – feel free to ask. We love questions!